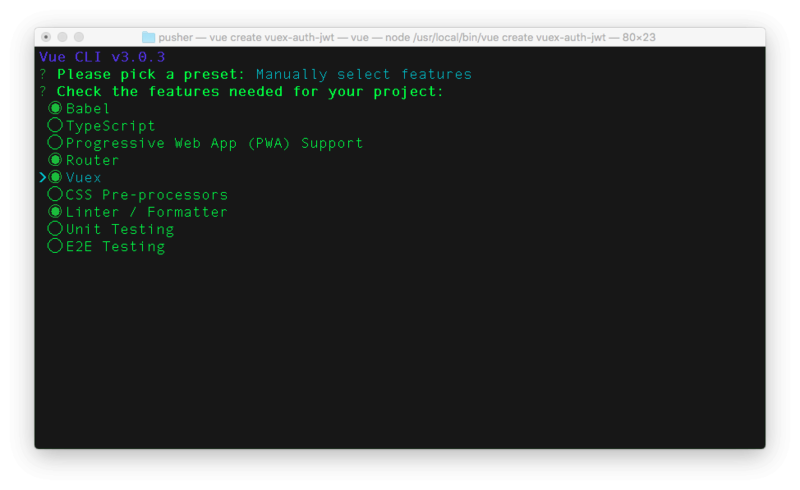 You will need Node 8.9+ installed on your machine, and the Vue CLI 3.0. Some knowledge of Vue will be helpful. The simplest option will be to set a unique token for each user in a localStorage. This means, whenever you need to access the user’s token or any other important user data for authentication purposes, we will need to fetch the token over and over again. To handle this properly and ensure the we don’t have to reach out to the localStorage all the time, we need to persist the required data and easily access it whenever we want to. This will ensure that we have a centralized location for all our important data. 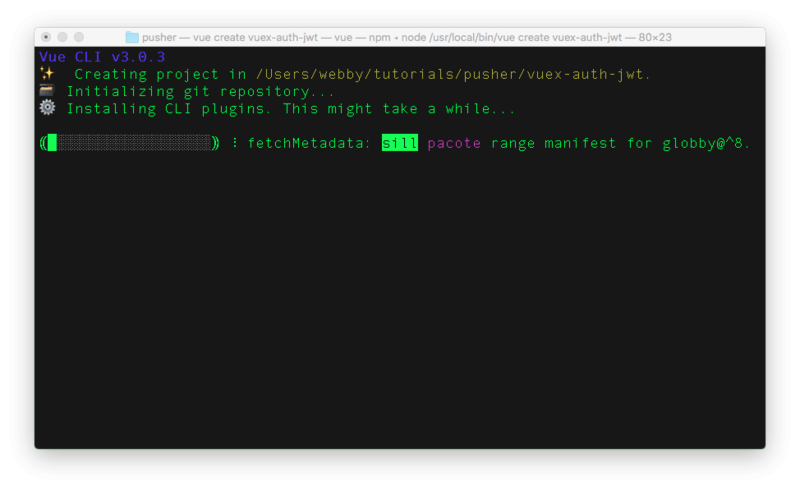 In this tutorial, we will be exploring the usage of Vuex to manage authentications within a Vue application. 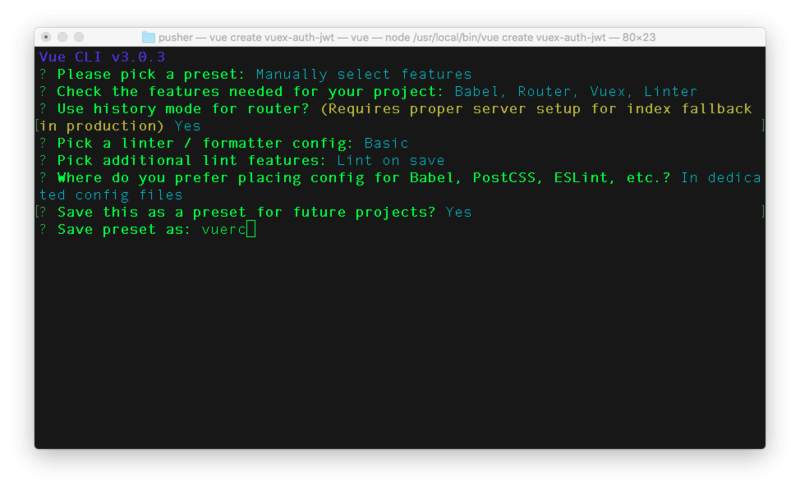 With this option, the Vue-CLI will automatically set up the store for Vuex and configure a file for router as well. A major benefit of the setup above is that it makes it very easy for us to call axios directly inside any of our application’s components by simply using this.$http. We also proceeded to set up Authorization header with a token that will be sent with our requests if required. sqlite3: asynchronous, non-blocking SQLite3 bindings for Node.js. body-parser: a package to help read the json data send to our server. What we have done in the file above is to require all the necessary packages for our server to run effectively as stated initially. A close look at the file again, you will notice that we are also requiring a database file DB and configuration file config. We will create these files in a bit. Lastly, we went further to set up a simple CORS middleware within a function named enableCrossDomain. This is to ensure that any cross origin resource errors are taken care of. The content above is used to define the route for registering a new user. Here, we passed the request body to the insert method with our database class that will be created in the next section. We added a callback function to handle responses and provide accurate information of an authenticated user. After successfully registering a user, we used email, since it will be configured as a unique field later in the tutorial to retrieve the user data and create an authentication token for the user by using the jwt packaged installed via npm earlier. We also used a secret key to verify a token sent to the server to uniquely identify a user. The configuration file for the secret key will be created soon. We basically received the request body containing the email and password of a user during the login process. We used bcrypt to easily compare the hashed password during registration with the supplied password and log the user in if there is a match, else we will throw an error. With the content above, our server will be available on port:3000. Now, we are done setting up our simple Node.js server. In case you missed any of the steps above, check here for the complete app.js file. Now that we are done setting up the server, let’s create the required components for the application. First, locate the src/components folder and create a new folder named auth inside of it. This newly created folder will house both the Login and Register components. Here, in the <template> section we created the required fields to log in a user and within the <script>, we added the data attributes that will bind to the HTML form. Lastly, we included a method to handle the login process. We are using a Vuex action named login to handle this authentication. We will set this up later. 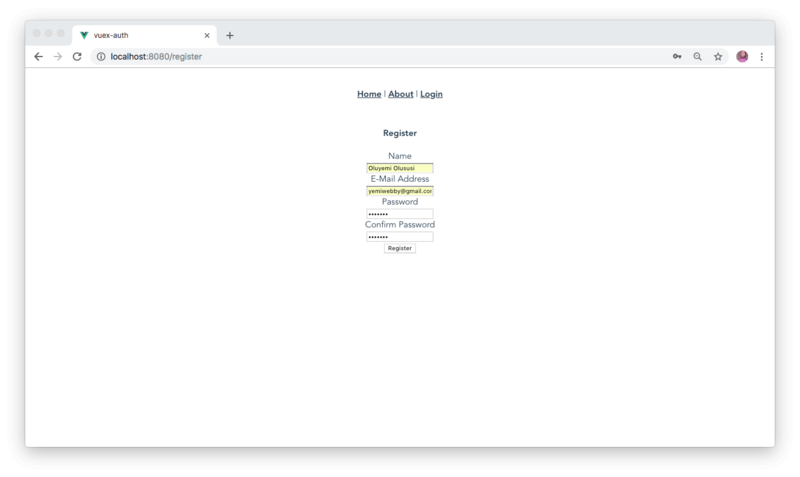 Similar to the Login component, we created a form with the required fields to register a user and set up a method to handle the registration process within the <script> section. We also used a Vuex action named register. One of the main objectives of this application is to give a user access to a particular protected resource once they are authenticated. Let’s create this secured resource page. Once a user clicks on the logout link, we dispatched a logout action to our vuex store and send the user to login page using this.$router.push('/login'). Here, we imported Vue, Vuex and axios and set the initial state for the authentication status, token and user information. The login action will be used to authenticate a user before logging in into the application and then commit the user’s credentials to the Vuex store. Within this action object, we made a call to the server’s login route and return the necessary data. We then store the token in local storage and then pass the token and user data to auth_success to update the store’s attributes. Saving the token within the local storage instead of Vuex store will help to ensure that the user will still be logged in for as long as the token is still within the validity time. Similar to the Login action, the will get the data of a user into our application and set a unique token in the local storage. After all the activity within our application, the user needs to be able to logout and have all the data created during the authenticated session destroyed. Once a user clicks on the logout link, we will remove the token we stored earlier. We imported all the required components and then proceeded to define routes for the application. The only route requiring authentication here is the route that points to the page we want to protect. That is why we had to add a meta attribute to the route definition. If an unauthenticated user hits the /resources endpoint, he or she will be redirected back to the Login component. We will set up the requiresAuth meta in the next section. This will start the development server for Vue on http://localhost:8080/, open that in your favorite browser to view the application. Proceed to the registration page http://localhost:8080/register and provide your details. In this tutorial, we were able to learn how to use Vuex to manage authentication within our application. We were also able to set up a protected route that only authenticated users can have access to and redirect any unauthenticated user to a login page. I hope you found this post helpful. Find the complete source code here on GitHub.